James McPake says more changes are required at Hibernian to help improve the club's fortunes. The Edinburgh club's captain says that, despite starting the season well, there is still a lot of work to be done before they are the finished article. "We are all battling for one another," McPake told BBC Scotland after their 2-1 win over Kilmarnock. "We are far from being a good Hibs team, but give the manager time and we will be." McPake joined the club in January, initially on loan from Coventry City before making the move permanant in the summer. The defender revealed that, when he was in talks with the club, he was aware of how big the job was at Easter Road to turn their fortunes around. "When the deal was being talked about, Cowdenbeath were favourites to beat us in the Scottish Cup," said McPake, whose side now sit second in the Scottish Premier League. 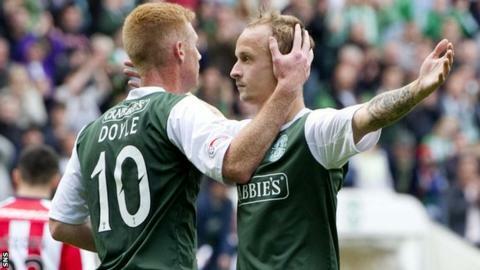 "That should never happen to a Hibs team. So, right away, I knew something was wrong. "You could see from the league position that we were low in confidence. "A lot needed to be changed and, in my opinion, a lot still needs to be changed." McPake also believes the fans have a huge part to play in the resurrgence of the club. He admits, though, that it may take more than a few good results for them to return to support the side after watching them struggle for the past few seasons. "They had every right to turn their back on the club and I'm sure some of them still have," McPake added. "We have just equalled the number of home wins we had for the whole of last season. "The fans backed us last season, especially when we had to beat Dunfermline to make sure we stayed in the SPL. "We are showing a fighting spirit which has been lacking, not just by the players but through the entire club."